Hey all. I know I’ve gone quiet for some time, but I think this might be an interesting discussion. Anyway, onto the subject. Fanwalkers! 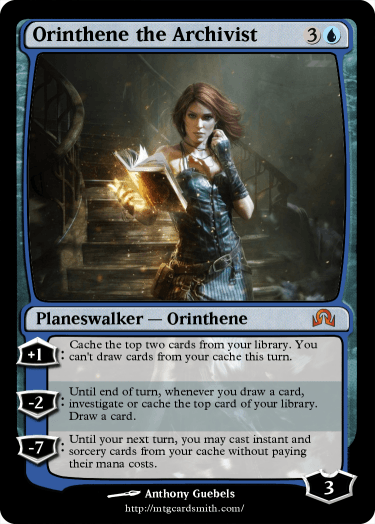 Fanwalkers are planeswalkers, and other characters made by cardsmiths like you. I’ve created several myself, and since MTGCS is such a diverse, vibrant community, I want to see what you have to offer! You can add whatever you need to this list! I hope to see some cool looking planeswalkers! Plane of origin: Devonia, a colonial plane that my friend calls “monsterless Innistrad,” where technology flourishes and people are constantly expanding their steampunk-powered cities. First planeswalk: After a planar hole ruptured at the bottom of a well, the planar energy caused several planeswalkers on Devonia to spark. Rusty was sent to Amonkhet, which coincidentally had just been connected to the west side of Devonia via a planar anomaly. Preferred form of Magic: Hieromancy and law powers, like the Azorius but solely focused on justice. Character’s strengths: An innate sense of good and evil. A LOT of charisma. An excellent friend, a very dangerous enemy. Character’s flaws: Very blind to the harm he causes in pursuit of good. Kinda clueless. @TezzeretofCarmot21, can we post multiple? It's a real shame that you never completed the Cardsmith Origins set. I do imagine that with your experience creatin custom sets should allow for a potential renaissance of it to come to fruition? @Ranshi922 You’re meant to post multiples! Post 5, 50, even 500! Or just keep it platonic. MTG Fanfcition: Tezzeret has a metal arm for more reasons than just aesthetics. MTG Fanfiction: Clearly you don't know what sort of "mind sculpting" jace can do. @Arceus8523 I have plumbed the depths of the Internet. The amount of completely strange Jace-Vraska scenarios I found disturbs me to this day. This is a joke. I am joking. @Arceus8523 All right, I’m laughing too hard. Show me Somnium, man! I love that set! okay. I have a few. here's two. Eltan is my fanplane, a wintry, medieval plane full of war, goblins, and arcane secrets. Backstory: on Eltan, Ignus accidentally killed a whole gathering come to watch him. He was flung off the plane by the force of the blast, and still hasn't told his sister, Lusa. After the blast, Ignus went to Innistrad, where he became an alchemist. He began to perfect the art of transmutation, and figured out how to transform himself temporarily into Aether. He followed an Aether stream intothe Blind eternities, and faced off against the true nature of the Eldrazi. Scarred and empowered by this, he became stuck in the Blind Eternities. He began to orchestrate Aether flows, Directing planeswalkers' first, uncontrolled planeswalks and shaping the destiny of the Multiverse. Character’s strengths: Extremely powerful, Plenty of intense magical study and a healthy resistance to explosion. Character’s flaws: Arrogance. He believes he can solve any problem that comes his way. also, he cant enter any planes. Backstory: Her planeswalk and close scrape with death on a hunting mission brought something back with her. this presence followed her, killing small creatures and sometimes people. She travels the planes, trying to save everybody from the darkness everywhere, unaware that she is spreading it. Preferred form of magic: Healing, resurrection,and a bit of necromancy. Character’s strengths: Able to manipulate the veil between life and death. Character’s flaws: Believes that in the end, nothing anyone does really matters. Plane of origin: Yuggoth. A world so far from its main star that most of the living beings there are fungus-based lifeforms which are extremely varied. Backstory: Among the others of its kind, Zrgob was considered to be just an average person. But in the eyes of the lower lifeforms such as the humans, Zrgob was a prodigy in the field of biology and thaumaturgy. One day, it conducted another experiment about of how to enhance a lifeform by creating its ultimate masterwork: An organism that could quickly evolve by just consuming a small speck of another organism. In the end, an accident happened due to the loss of control, resulting the merging of Zrgob and the organism, igniting its dormant planeswalker spark and resulting the birth of the new being called the Thousand-Faces, a lifeform without any real concrete form, an amorphous, sentient organic mass that could absorb mana from its surroundings and change its shape by consuming another biological beings. But was that actually an accident or carefully planned actions? Nobody knows for sure due to the vanishment of its laboratory and all the evidences shortly after the accident happened. Preferred form of magic (hieromancy, necromancy, et cetera): Biomancy, illusion, mind-control. Character’s strengths: Genius-level intellect (still increasing after each consumption of another sentient being), has a complete control of every cell of its form, making it an excellent all-around in every class. Character’s flaws: Losing the understanding about emotions turned it into a cold and calculating being, an uncaring entity that would only think based on possibilities instead of emotions, loss of innate sense of good and evil. Backstory: After losing both parents to a raid of orcs, he wandered the country side looking for help. Years passed, and a cold, deadly winter came with another group of orcs hunting him down. They caught him, and as they were about to execute him then and there, he grabbed one's ax and killed another one with it. Magic corsed through his veins, the ground around him moved at his will. After a short battle, he ran. As fast as he could, and ran to a small bit of smoke. Orcs started coming out of the nearby tents, and that's when his spark ignited. Flaws: Has the fantasy equivelant of PTSD, unable to work with others. @TezzeretofCarmot21, have you even seen the Jyotika cards? or are you just judging by her name? What do we do after we make these? @Ranshi922 Yeah, I have. She’s the black flip walker that can become white and flips if you gained/lost 5 or more life, right? Oh right! 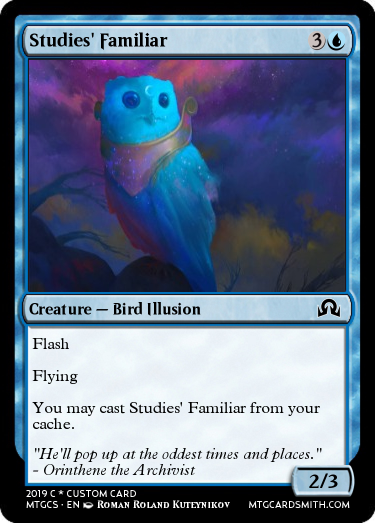 My first color shenanigans card! In Dominaria, long ago, an aspiring urza took the mantle of genetic mutation. He took a powerful warrior, a tamed dragon, an imprisioned sliver, and a scheming lich. 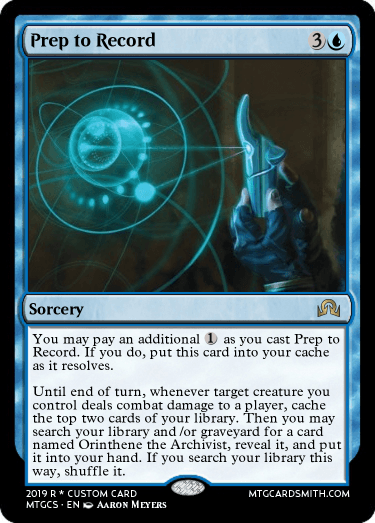 Urza then activated the experiment, attempting to give each one the abilities of the other, and it worked. Each one could practice anothers magics, but the dragon barely survived. It had mutated into a steel-skinned, skeletal mess of sliver, human, sliver, and dragon limbs. It had also grown so large that mountains dwarfed compared to it. Urza ran, fleeing for his life, as his monster killed the other test subjects. Later, Urza returned to the beast, now resting where a mountain once was, with armies of powerful mages, and they began to cast a spell. A massive fireball grew from the armies' hands until it was the size of the beast itself. As it hurled towards the beast, the dragon's planeswaker spark ignited, flinging him to the blind eternities, where the true eldrazi stood. The mutations pressed upon the dragon led to its survival, and it even ruled over the eldrazi. This is where Brink, Leader of the Eldrazi stands, waiting, biding its time, but soon, it will strike, and no plane will be safe. Preferred form of magic: All, and some undiscovered by anything else. Strengths: Can literally crush armies in its hands, enough strength to destroy entire planes. Can teleport to bling eternities, where no one can follow. Weaknesses: Can only focus on one army, goal, or battle at a time, easily overwhelmed. Orinthene blinked, trying to clear her vision; it didn't help. The blurriness had nothing to do with her eyesight, rather, it was due to the heavy rain on the window pane through which she now squinted. "Torches?" she thought, "Could those little faint red glows out there be torches?" As she lived on the border of Avabruck, strange sounds and sights weren't really foreign, more intriguing then anything else. As the bright spots vanished from view, either because they were too far away or because the rain had swelled to a downpour, Orinthene decided she better turn in for the night. Orinthene was fourteen years old and lived alone in a small run down cottage, what many would call a hut. Not much to look at from outside or in. Her parents were loving wonderful teachers and guardians that had been... misplaced, somehow. Orinthene had carried on alone with a touch of grief and a longing to know just what had befallen her beloved father and mother. She awoke with a start only a few hours later to the sound of howls. "Mondronen" she surmised. Living this close to Avabruck meant that Orinthene knew enough that she wasn't easily startled or surprised. She drifted off to sleep. Orinthene's discovered that she can planeswalk. During the werewolf attack after the wards around Avabruck's central cathedral, the Temple of Saint Raban, failed. She returned to Innistrad shortly after. She doesn't wish to be anywhere else, she'd begun to archive. Her hut had become a storehouse of documents and research. Mostly in an effort to determine the fate of her parents, she'd now delved into the mysteries of every race on the plane and documented her findings. She's recently learned of Arlinn Kord, she'd witnessed Avacyn cursemuting or killing hundreds of werewolves, and knows of the angel's church launching a new inquisition more terrifying than anything they've done before against the lycanthropes. Not much of it matters as long as she's left to continue her vigil and learn the full extent of what there is to be learned on Innistrad. Orinthene's sole goal is to be left alone and undisturbed. She has no desire to assist the coming Gatewatch or engage in the struggle of the native races. 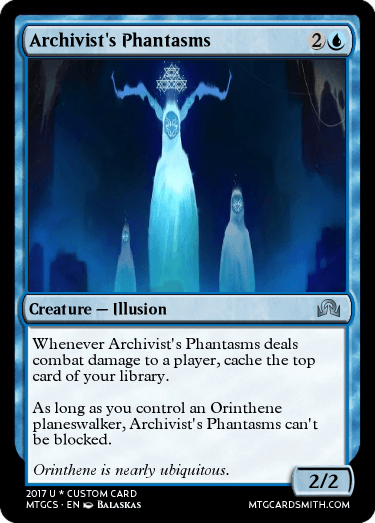 Her inherent powers are few, but empower her to keep her archive safe an obscured while simultaneously allowing her to go places others cannot as she collects little known facts. Both Prep to Record and Studies' Familiar have undergone revision since last posting.